The Inquisitor Korsakov build is nearing completion. 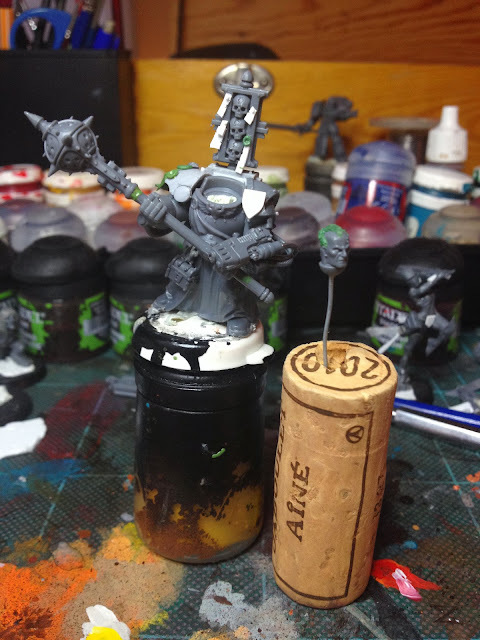 Added the obligatory smattering of purity seals, shortened the mace somewhat (at Mr.Wiers suggestion) and gave him some hair to de-marinify him somewhat. It makes him look a bit like Peter Cushing which of course is a good thing. Also updated the repentia I made a while ago with a new head from the dark elf cavalry kit. 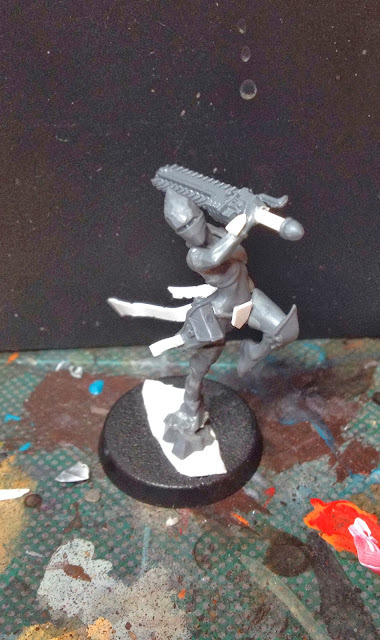 Oh yes - she is now a space ninja. The Inquisitor is looking really nice! The purity seals look great as does his hair. It is hard to tell, but does his head still have the service studs awarded to space marine for every century of service? If so, I think I would remove them to further distance him from the space marine vibe. The Sister Repentia is looking sharp as well. That Dark Elf Dark Rider head works really well, great idea. Another good use of the witch elves! Those heads fit remarkably well. I look forward to seeing more. The inquisitor is coming along nicely, I really like the incorporation of the plasma pistol; it makes a rather unwieldy weapon look a lot more manageable. Nice to see you still going strong into 2014! Keep it up! Nice work on the sister repenta, although I wonder how it would look to have that face, but the witch elf hair? Ha! Good point, although "sensible" is rarely the sort of thing you associate with chainsword swinging loons.